My first fake Gameboy Advance cartridge! 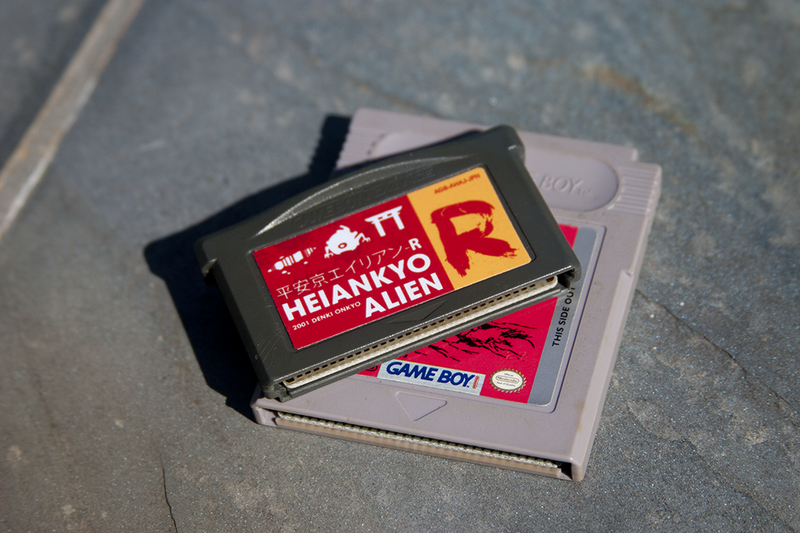 Believe it or not, Heiankyo Alien used to be kind of a big deal in the video game world. Developed for Japanese computers in 1979 by The University of Tokyo's Theoretical Science Group, a year later it was released in arcades by Denki Onkyo and ruthlessly ripped off by several other game makers (read more on the wikipedia page). 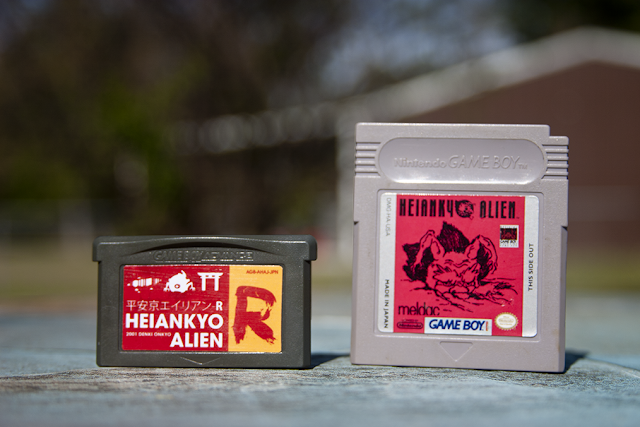 You play a police officer defending the city of Heian-kyo (peace and tranquility capital, a former name for Kyoto) from an inexplicable alien invasion by running along the streets digging holes and trapping the monsters Dig-Dug style. Nice graphics, right? This simple concept was often cloned and imitated, but you don't really see this type of gameplay anymore, do you? I don't keep up on mobile games but there's a chance someone has revisited the style. In any case, I don't have a great deal to say about Heiankyo Alien but I like it and the world has gone too long without a sequel. 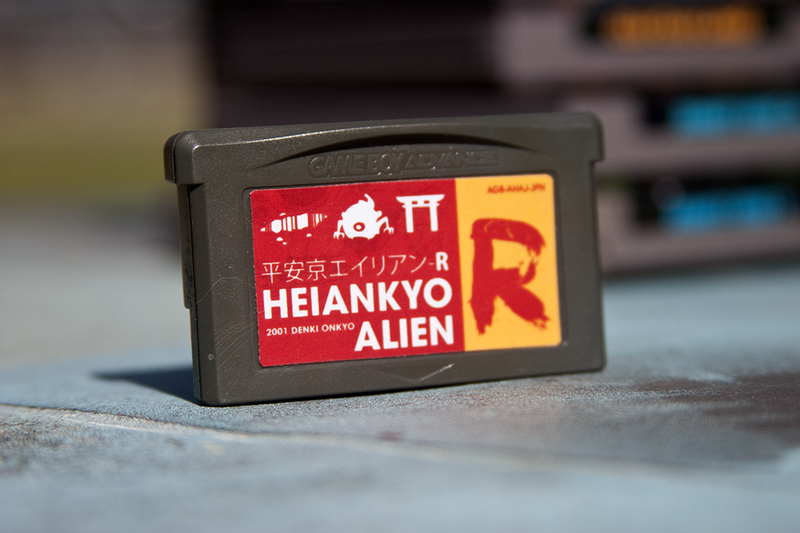 Here's Heiankyo Alien R (REBIRTH)! 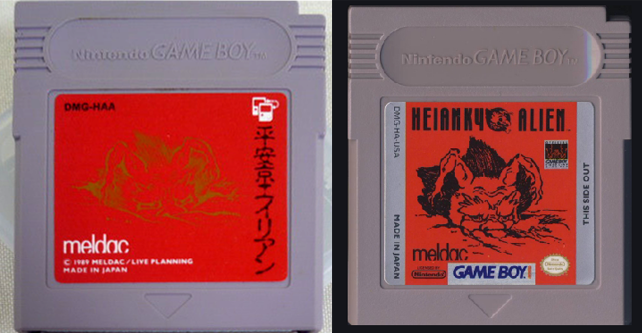 I wanted to keep it simple to reference the bizarre style of the Game Boy port (by Meldac, most infamous for Zombie Nation) while making it look a bit more up to date. More Heiankyo Alien chat and pictures behind the link. Here's a pointless story--I found the Game Boy port not long ago in a plastic container at a Houston used game store, and they told me they couldn't find it in their store database so they gave it to me for a dollar. I was hoping I had hit the jackpot because I hadn't even known Heiankyo Alien had been released in the West, but it only goes for a few bucks on eBay anyway. OH WELL! I often saw on the Internet many different interesting comparisons of these two wonderful game consoles. And I can say with confidence that they are both excellent, I think so, because I previously owned both consoles. Nowadays I also like to play retro games, but I use for that gba roms https://romsmania.com/roms/gameboy-advance and absolutely satisfied with the result.